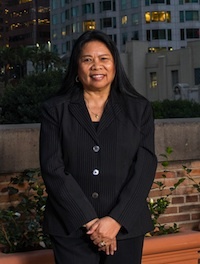 For nearly 35 years, Violet Canlas Rabaya has successfully litigated and tried cases in state and federal court, and before arbitration panels and administrative hearings, involving claims totaling tens of millions of dollars in the aggregate. Ms. Rabaya has an established track record of success, achieving numerous victories against the most aggressive and well-funded corporate and governmental adversaries. Known as a “leader among leaders” and a woman in “perpetual motion,” Ms. Rabaya has been a vigorous champion of causes of the less fortunate or underrepresented, and most assuredly, a beacon for all Filipino Americans in her steadfast advocacy for the rights and interests of the Filipino community throughout California. Since 1986, Ms. Rabaya has practiced law as the principal of the Law Offices of Violet C. Rabaya. She has earned a sterling reputation as a trial lawyer and advocate for clients seeking vigorous and intelligent representation in diverse areas of law, including business and civil litigation, criminal law, employment law, family law, personal injury, and probate law. Ms. Rabaya is an accomplished trial lawyer, representing both plaintiffs and defendants throughout California, achieving multi-million-dollar verdicts and settlements, and defeating many other cases by unanimous jury verdicts for the defense. She also has successfully briefed and argued many complicated and high-level appeals, in both civil and criminal matters, involving bet-the-company and life-and-death cases. Prior to establishing her own law practice in 1986, Ms. Rabaya worked for several years as a trial lawyer and advocate for indigent criminal defendants and for the protection of residents impacted by massive public infrastructure developments. Between 1980 and 1986, Ms. Rabaya worked as a senior attorney at the Office of the Advocate for Corridor Residents, Inc., after having been recruited by the Center for Law in the Public Interest to become the first independent monitor of the Federal Highway Administration and Caltrans regarding the building of the Century Freeway (105 Fwy). She was appointed by Judge Harry Pregerson to create this independent agency to safeguard the rights of corridor residents. Ms. Rabaya was the Corridor Advocate and President/Executive Director of the Board of Directors. Her office negotiated fair market values for the home owners in the right of way, monitored the distribution of relocation funds, and established guidelines with the federal and state highway administrations for eligibility for replacement housing to be built in the surrounding communities. Her office was responsible for the relocation of more than 25,000 people. From 1979 through 1980, Ms. Rabaya worked as a trial and appellate attorney at the Legal Aid Foundation of Los Angeles. She was part of the Greater Watts Justice Center, a special unit of Legal Aid, which specialized in representing criminal defendants in trials in which individuals were wrongfully accused of interfering with or assaulting police officers in the performance of their duties to mask police misconduct. Ms. Rabaya’s involvement with the Justice Center in these regards resulted in the enactment of a Right to Witness Ordinance in the City of Los Angeles, which remains in effect to this day, protecting the rights of Los Angelinos in their interactions with peace officers. Ms. Rabaya started her legal career in 1976 at the State Public Defenders' Office, where she worked as a criminal defense attorney for two years. Ms. Rabaya did extensive criminal appellate work, writing many briefs and arguing before the Court of Appeal in several districts in Southern California. At end of her tenure, she successfully argued before the California Supreme Court in People v. Lewis (1978) 20 Cal.3d 496, a landmark case which established procedures regarding the right to legal representation for indigent defendants. After graduating as the Valedictorian of her high school class, Ms. Rabaya was accepted at the top 1% of her class at U.C.L.A. She graduated with honors in 1971 with a degree in History and a minor in bacteriology. Berkeley law (Boalt Hall) then accepted Ms. Rabaya as a law student, where she excelled as a scholar and a student leader. During her second year at Berkeley Law, Ms. Rabaya was elected president of the Asian-American Law Students' Association, chair of the Boalt Hall Admissions Committee, Senator of the Associated Students, and Chair of Asian Board (the umbrella organization consisting of all graduate and undergraduate Asian associations). Then, in her third year, Ms. Rabaya was elected Student Body President of the entire University of California at Berkeley, where she also chaired the National Student Body Presidents' Association for the entire United States. She later sat on several community boards and associations, including the Asian Law Caucus, Inc. (which was instrumental in obtaining -- and filed the legal briefs -- for reparations for Japanese-Americans interned during World War II and in establishing citizenship and benefits for Filipino-Americans serving during the War). Ms. Rabaya graduated Berkeley Law in 1975, and passed the California Bar shortly thereafter. Senior Counsel for the Filipino-American Community of Los Angeles, Inc. Founding Director, Filipino Legal Outreach Center, Inc.
Ms. Rabaya shares the Firm’s commitment to pursue justice and fairness in the communities in which the Firm’s attorneys actively practice law. Ms. Rabaya believes that the good will garnered by the pro bono and community-support activities undertaken by the Firm’s attorneys and staff enhances the Firm’s ability to advance and protect its clients’ interests before local judges and juries.